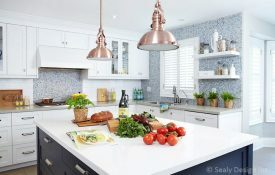 Copper gets a traditional metal gets a shiny update | Sealy Design Inc.
Copper has made a refreshing comeback lately in lighting, hardware and accessories, complementing the metals — oil-rubbed bronze, brushed chrome, polished nickel and antique brass — that we’ve grown accustomed to over the last several years. And while it certainly isn’t a new metal in the home, this time around designers are shunning the aged, penny-brown-to-greenish-black finish often associated with it. Today copper is being polished to a high sheen, allowing its pink and orange undertones to shine through.